Updated December 21, 2012, 7:27 p.m. ET. In his last few years, Adam Lanza shut himself off from the outside world almost completely, his troubles slowly escalating as his family splintered. A Wall Street Journal review of public records and interviews with more than three dozen government officials, relatives and friends of the Lanza family reveal that Mr. Lanza's alienation began at a young age, causing interruptions in his education and making it more difficult for the withdrawn boy to make lasting friends. The troubles began shortly after Peter and Nancy Lanza moved in 1998 with their young sons to Newtown, Conn., from the New Hampshire and northern Massachusetts countryside where they both grew up—a change Nancy called the family's "great adventure," said Peter's sister-in-law, Marsha Lanza. The move would be a turning point. At the age of six, Adam Lanza had problems soon after he started first grade at Sandy Hook Elementary School. Wendy Wipprecht, a 62-year-old freelance editor whose son, Miles Aldrich, was a classmate of Mr. Lanza, said she remembers a "couple of long talks" with Nancy Lanza. "She was concerned about Adam," said Ms. Wipprecht, whose son is autistic. "He was clearly a very bright boy, but he wasn't doing all that well in school or somehow not comfortable in school." By the 4th or 5th grade, Nancy was frustrated that the school refused to put Mr. Lanza in classes for academically gifted students, her sister-in-law, Marsha Lanza, said Nancy told her. At around this time, Ms. Lanza pulled her son out of school to home-school him or possibly enroll him in another school, family members and friends said. "She said [the school district isn't] meeting her needs," Peter's sister-in-law Marsha Lanza said. Updated December 21, 2012, 9:02 p.m. ET. KINGSTON, N.H.—The gunman responsible for the Newtown, Conn., shootings spent the first six years of his life growing up amid the farmland and woods here in the southern New Hampshire countryside. Adam Lanza was born into a family full of promise with deep roots in this community. His mother, Nancy, grew up in an old farmhouse built in the 1740s in Kingston, a postcard-perfect New Hampshire town near the Massachusetts border. Nancy was the girlish, intelligent daughter of Don Champion, a TWA pilot, and his wife Dottie, a school nurse. The Champions had another daughter and two sons, and raised their children to be respectful, friends said. Nancy's brother, Jimmy Champion, became a local police officer in town and recently retired. "Jimmy Champion still calls me Mr. Smith," said Larry Smith, a longtime friend of the Champion family. "He will not call me by my first name because that's the way they were brought up. They were brought up very well." His wife, Judy, added: "They were wonderful children." Less than 15 miles away in northern Massachusetts, Peter Lanza, nicknamed "Mousey" in his high school yearbook and known as P.J. to family, was growing up with two brothers in Haverhill, the shy, smart son of a successful insurance salesman. ::snipping2:: On Dec. 20, 2012, the American Psychiatric Association (APA) sent out a Psychiatric News Alert expressing its concern about blaming Adam Lanza’s crime on Asperger’s syndrome, Autism, or mental illness. WOW. That looks nothing like the young man we've seen photos of. You can see a light in this kid's eyes and a real smile on his face. ROSWELL, Ga. -- Earlier this week, a Metro Atlanta mother came forward in response to the mental health issues raised in connection with the massacre in Newtown, Connecticut. Her own, 25 year old son, she told 11Alive News, is dealing with mental illness and she hadn't been able to get help for him, or convince him to get help. He was choosing to remain homeless. She kept struggling on his behalf, and wanted other families suffering, and dealing with, mental health issues to know they are not alone. I agree. If someone is coming into your school with his gun drawn then he is coming in to do damage. I also believe that the lower level windows need to be secured. Make it more difficult for a person to gain access by blowing out the school window. I see a lot of schools that have this grating covering the windows now where it will still be impossible to gain entrance. Why does there have to be a one sized fits all policy? Why can't communities make their own decisions? Put their own plans into place? I've listened to the 'gun free zone' arguments and think that 'gun free' makes them sitting ducks. The problem with a 'one size fits all' plan? They're still sitting ducks. If everyone knows 'the plan', regardless of what 'the plan' is, I think it makes them sitting ducks. Why not let every community come up with their own plan and live and die with the consequences? How many would know of a shooting in CT a hundred years go? Before modern communication? Not many. Likely it would not have made the national news. I think there is a real blurring of what is important as a nation and what is important at the community level. If you take out the 'risk' and make everything a known quantity, what is the point in having a master plan for every school? How do they get out in the event of a fire? Fix one problem and create another? Re-engineer every school in America and the nation goes bankrupt because of one tragic event at one school? Isn't it possible that crazy/insane/terrorist people will just engineer a way around all those preventative measures? Go bankrupt and enable terrorists? Anyone ever build a better mousetrap? Eliminate all mice? I don't think so. Look at housing codes and doors. For thousands of years, door opened in. For some reason, smart people decided that in case of fire, someone might be saved by having the door open outward. Don't thousands of years of experience mean anything to 'smart' people? Many of the schools I've been in already have lower windows that do not open. They are climate controlled and nobody can open the window, much like a hi-rise. What is there to secure? Every solution is also a problem waiting to happen. I grew up in So. Cal., all of the schools built in the 50's & 60's were built with an open campus. Classrooms spread over many acres - they are not a single building or two as there are throughout most of the rest of the nation. Securing them is so much more difficult than say locking the front door with one way in and out, logistically impossible. Fences have risen, gates are sometimes locked, how do they make such campus' safe and secure? My husband worked maintainance for over 25 years at a middle school campus in an extremely gang-infested area. The district tried armed sheriff's, armed guards etc., went to every extreme possible to the point it was cost-prohibitive. We didn't see much of any of these measures really work........When a punk wanted in they found a way, be it to attack a child or teacher, set fires and many times they were armed. It came to a point where the district enclosed the office/administration building in wrought iron fencing, security alarms & locks to protect the office staff but the classrooms are still open and easily accessable............This is just one school out of 45 in my district alone in a community that was once considered a safe/quiet town! Now between the gangs and the mentally ill roaming the streets, the violence happening rarely makes the news. I know with California's strict firearm laws there will never be armed staff. We retired to Texas, another small town....pop. 5,000, this week alone the high school has been cleared out 3 times due to bomb threats.......they caught the 3 girls leaving the threats in the bathrooms......they are facing 3rd degee terroriisms threats, all because they probably wanted out of testing. The school district that are having they're staff arming themselves is a hundred miles up the road from here and I imagine it won't be long before our schools will do like-wise. Who would have thought that the USofA would have to resort to this to protect our children! Don't often post, but do read! And appreciate this site to help deal with the feelings and get answers. It would be wonderful to put into place a lot of these measures that have been discussed, but what if the 1-3 people on staff who are sharpshooters and armed are not in that day, in a very different area, doing different tasks, etc.? Schools and parents have been raising money for a long time for arts and staff - if a certain group wants to do that for an armed guard, go for it - I would! (however, that armed guard needs to be in the right area at the right time if something happends) . Unfortunately, they will leave the poorer districts out in the lurch. MORE training for school staff! Parents must attend NAMI to fully understand (in an experienced support group) what is going on with their young person. It seems to me AL should have been put in some type of residential treatment a long time ago, he was really breaking down, staying in the house is just not normal for as long as he was, though I do acknowledge there may have been legalities that took way too much time to force him into this (a kind of comittment) because many will not willingly go). Yes, there is a stigma to MI and most MI people are harmless, prefer to harm themselves, but guns in any type of home that has vulnerability (domestic violence, laxity, substance abuse ) can be very scary. I took a walk down the block and took a picture of the windows of the elementary school down the block. These gratings are all around the school and I'm sure in case of a fire that they could be opened. I'm also sure they could get out the doors of the schools 5 main entrances. Even if the windows were secure I'm pretty sure they aren't bullet proof. Adam Lanza shot the windows to gain entrance. Babs our little town once was a safe place but no any more. I have nieces and nephews that work in the school district there it isn't getting any better. While everyone has had wonderful post and insights to this horrific crime. I don't see any answers to what is happening in our country. I see a mother that made some really bad choices what ever her reasoning was. It's been said she needed them for protection. Really. You need an assault rifle. She knew her son had mental issues and she still thought it was okay to have guns in her home. To me that was a very bad choice. Why put temptation any where around someone that is hurting themselves as it's been reported. I am sorry but in my opinion that is asking for problems. I understand trying to get help for anyone with a mental health problem is difficult for many reasons. I think we need to focus on fixing that. But to me the mom had her own issues and made some really bad discussion, And that is why there were 26 innocent lives lost. I guess what I am trying to say where has common sense gone. I just don't see much of it out there any more. I agree. It was said that she kept the guns in the same part of the house he played he video games but it was only in a different area in the basement. They said the guns were secure. How secure could they have been if he had access to them. Its not just one tragic event at one school. Its happened multiple times. Go bankrupt if it means protecting our children. not really sure u understand the magnitude of that one event..
(AP Photo/Seth Wenig). While their son Jake Hockley stands between them, Nicole Hockley and her husband Ian Hockley touch their heads together at the end of a funeral service for their son Dylan Hockley in Bethel, Conn., Friday, Dec. 21, 2012. NEWTOWN, Conn. (AP) - Newtown's children were showered with gifts Saturday - tens of thousands of teddy bears, Barbie dolls, soccer balls and board games - and those are only some of the tokens of support from around the world for the town in mourning. Just a little over a week ago, 20 children and six school employees were gunned down at Sandy Hook Elementary School. Twenty-year-old Adam Lanza killed his mother, attacked the school, then killed himself. Police don't know what set off the massacre. Days before Christmas, funerals were still being held Saturday, the last of those whose schedules were made public, according to the Connecticut Funeral Directors Association. A service was held in Utah for 6-year-old Emilie Parker. Others were held in Connecticut for Josephine Gay, 7, and Ana Marquez-Greene, 6. All of Newtown's children were invited to Edmond Town Hall, where they could choose a toy. Bobbi Veach, who was fielding donations at the building, reflected on the outpouring of gifts from toy stores, organizations and individuals around the world. "It's their way of grieving," Veach said. "They say, 'I feel so bad, I just want to do something to reach out.' That's why we accommodate everybody we can." The United Way of Western Connecticut said the official fund for donations had $2.8 million in it on Saturday. Others sent envelopes stuffed with cash to pay for coffee at the general store, and a shipment of cupcakes arrived from a gourmet bakery in Beverly Hills, Calif. The Postal Service reported a six-fold increase in mail in the town and set up a unique post office box to handle it. The parcels come decorated with rainbows and hearts drawn by schoolchildren. Some letters arrived in packs of 26 identical envelopes - one for each family of the children and staff killed or addressed to the "First Responders" or just "The People of Newtown." One card arrived from Georgia addressed to "The families of 6 amazing women and 20 beloved angels." Many contained checks. "This is just the proof of the love that's in this country," Postmaster Cathy Zieff said. At the town hall building, the basement resembled a toy store, with piles of stuffed penguins, dolls, games, and other fun gifts. All the toys were inspected and examined by bomb-sniffing dogs before being sorted and put on card tables. The children could choose whatever they wanted. Jugglers entertained the children, a dunk tank was set up outside and the crowd of several hundred parents and children sang an enthusiastic rendition of "Happy Birthday" to one child. A man dressed as Santa Claus was in attendance, and high school students were offering arts and crafts such as face painting and caricatures. 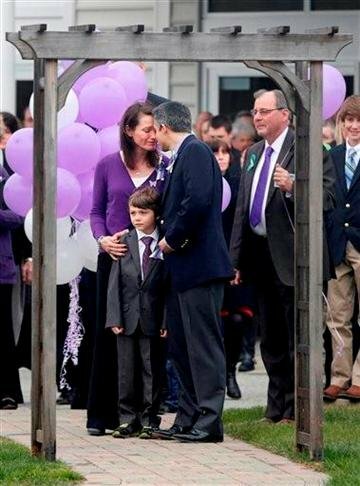 Newtown resident Amy Mangold, director of the local Parks and Recreation department, attended with her 12-year-old daughter, Cory. She acknowledged that most people here could afford to buy their own gifts but said "this means people really care about what's happening here. They know we need comfort and want to heal." She pointed to two people across the room. "Look at that hug, that embrace. This is bringing people together. Some people haven't been getting out since this happened. It's about people being together. I see people coming together and healing." Town officials have not decided yet what to do with all the money. A board of Newtown community leaders is being established to determine how it is most needed and will be best utilized, said Isabel Almeida with the local United Way, which has waived all its administrative fees related to the fund. She said some have wondered about building a new school for Sandy Hook students if the town decides to tear the school down, but that decision has not been made. And while the town is grateful for all the support, Almeida said, it has no more room for those gifts. Instead, she encouraged people to donate to others in memory of the Sandy Hook victims. "Send those teddy bears to a school in your community or an organization that serves low-income children, who are in need this holiday season, and do it in memory of our children," she said. Associated Press writers Allen G. Breed, Christopher Sullivan, Eileen AJ Connelly, Susan Haigh and John Christoffersen contributed to this report. A simple silver butterfly is pinned above her heart on the vibrant purple sweater she wears in honour of the little boy she called ‘Mister D’. Her faced is etched with grief as she talks of her ‘special angel’ who will never get to unwrap the Christmas presents that sit under the family tree. Yet, in her quiet agony, Nicole Hockley – mother of Dylan Hockley, the young British boy who died in America’s worst school massacre – is determined to focus on the positive. Dylan, who suffered from autism, died cradled in the arms of his devoted special needs teacher Anne Marie Murphy who was also killed. Page created in 2.474 seconds with 19 queries.